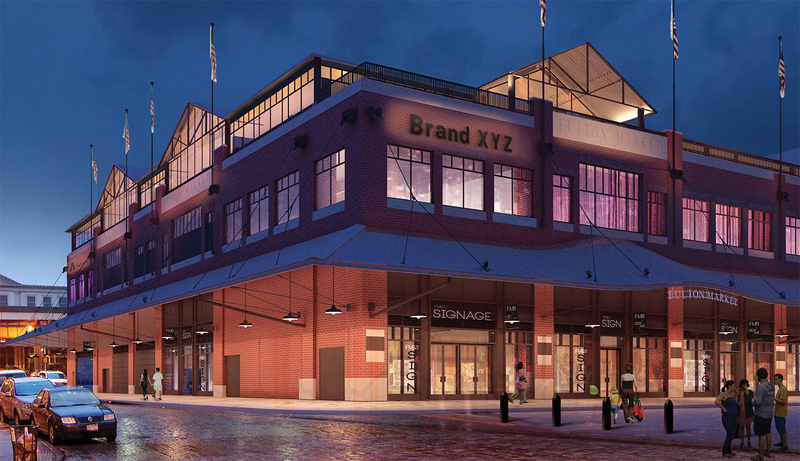 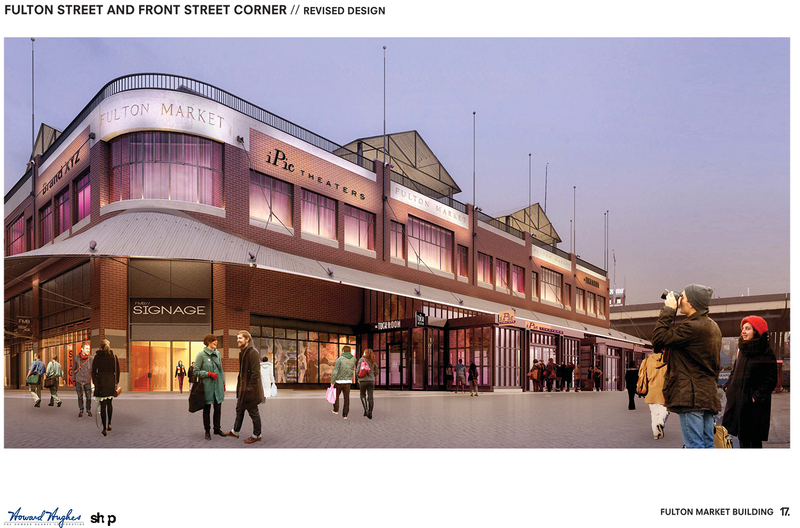 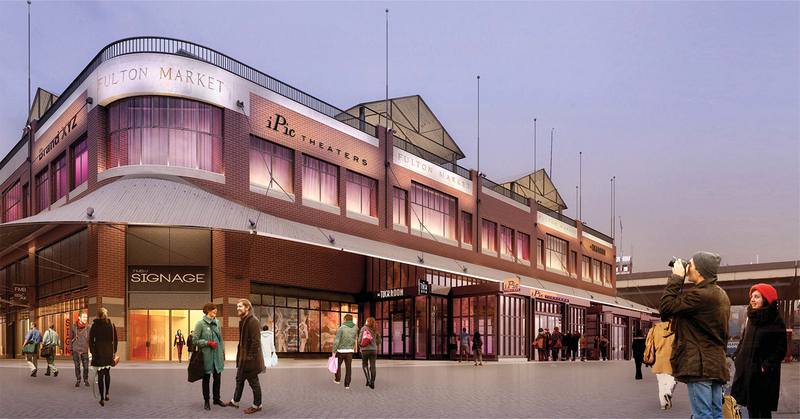 The Howard Hughes Corporation’s effort to revive the South Street Seaport is getting closer to reality. 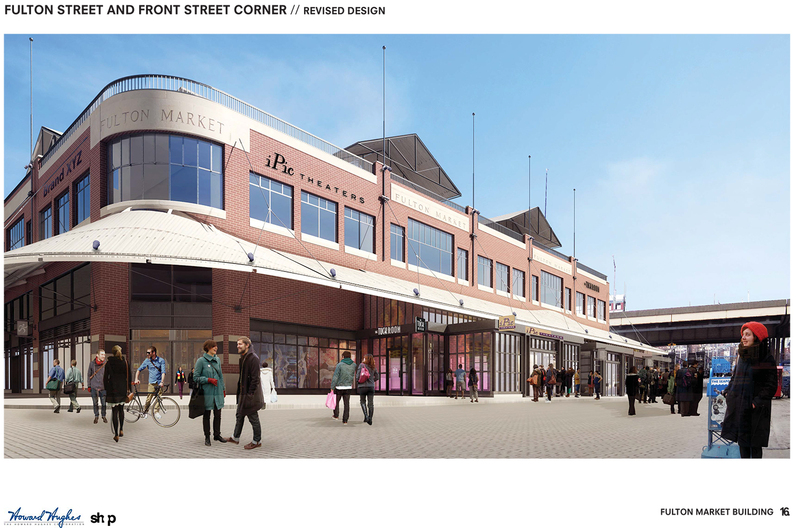 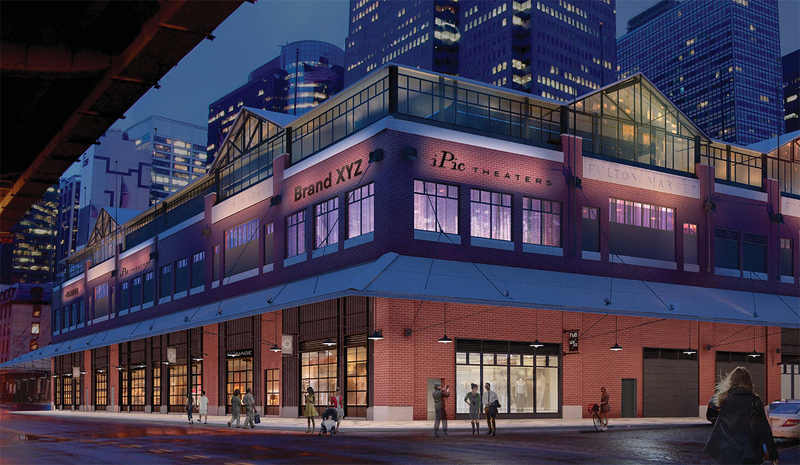 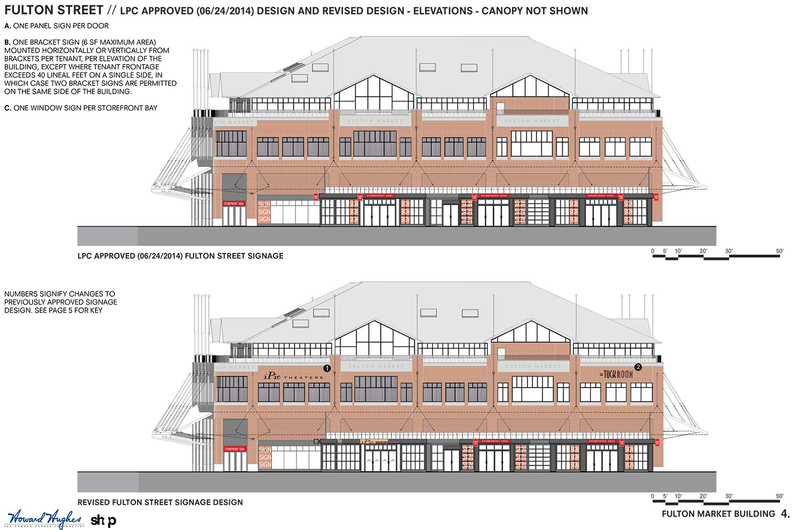 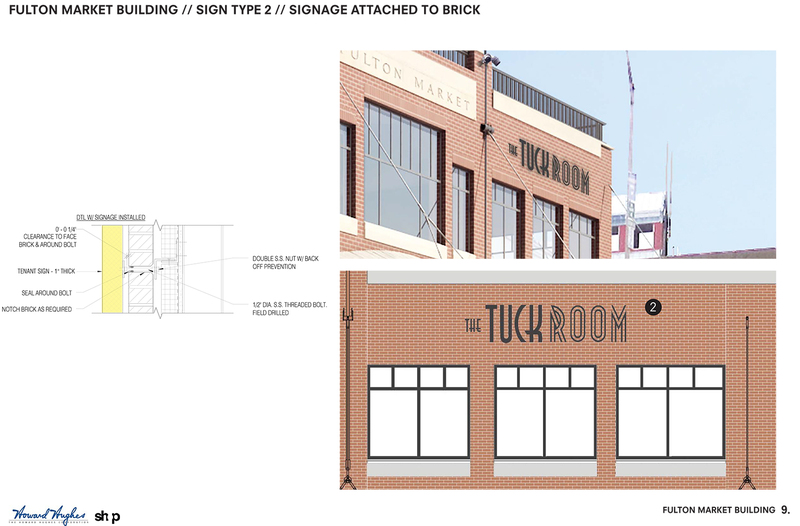 On Tuesday, the Landmarks Preservation Commission approved revised plans for the exterior of the Fulton Market Building. 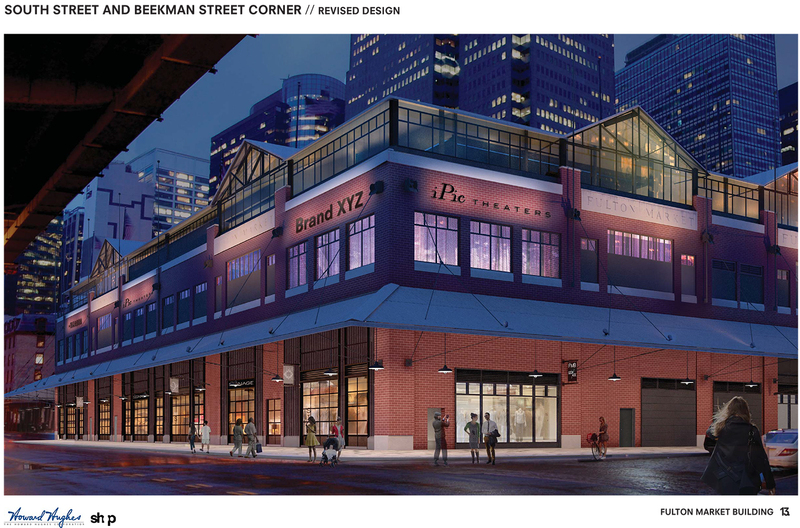 That’s located at 11 Fulton Street, which occupies the block bound by Fulton, South, Beekman, and Front streets, in the South Street Seaport Historic District. 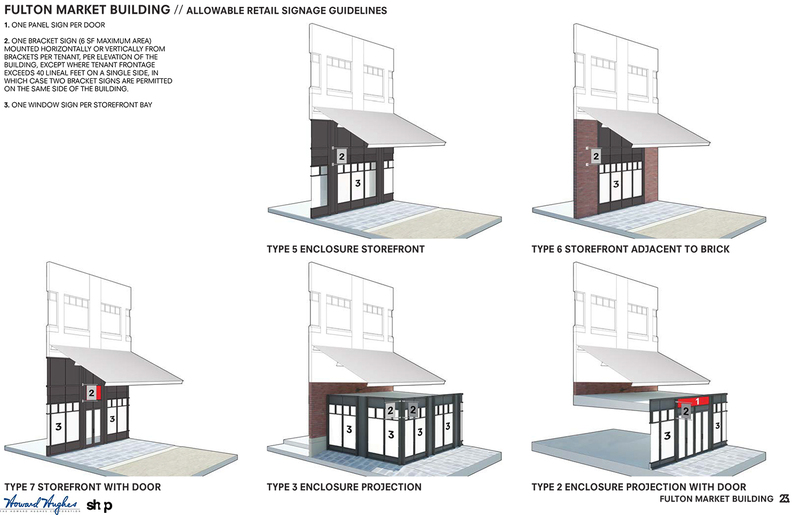 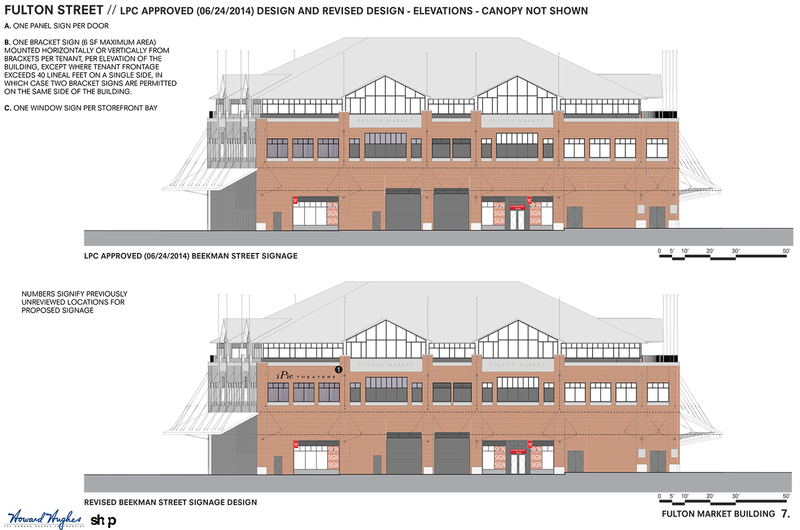 It was almost two years ago that the LPC approved the SHoP Architects-designed revamp of the 1983 structure. 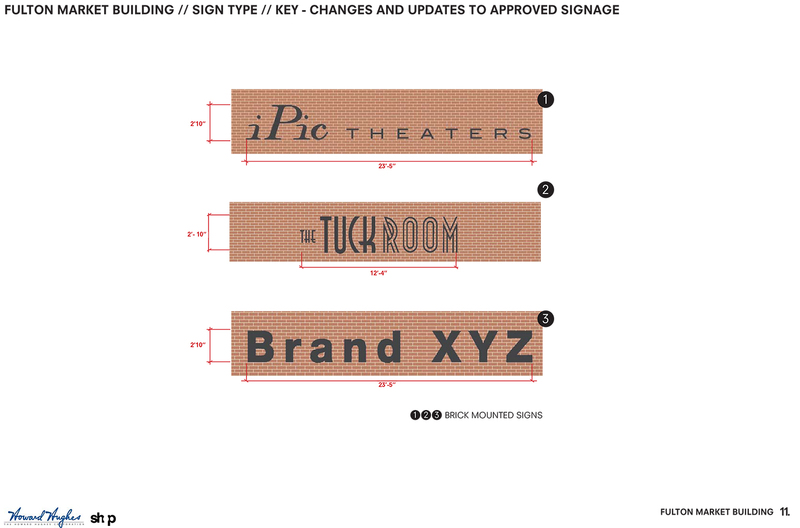 This tweak involves signage. 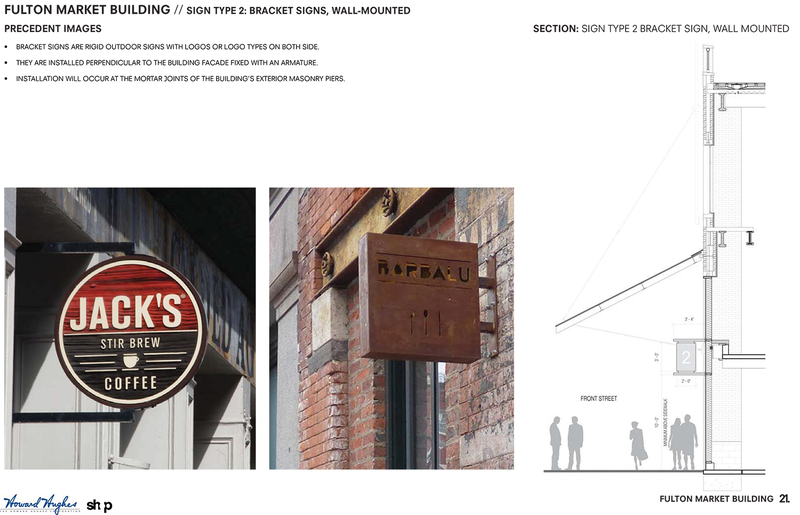 The LPC can’t tell Hughes what the signs can say, but it can regulate their size. 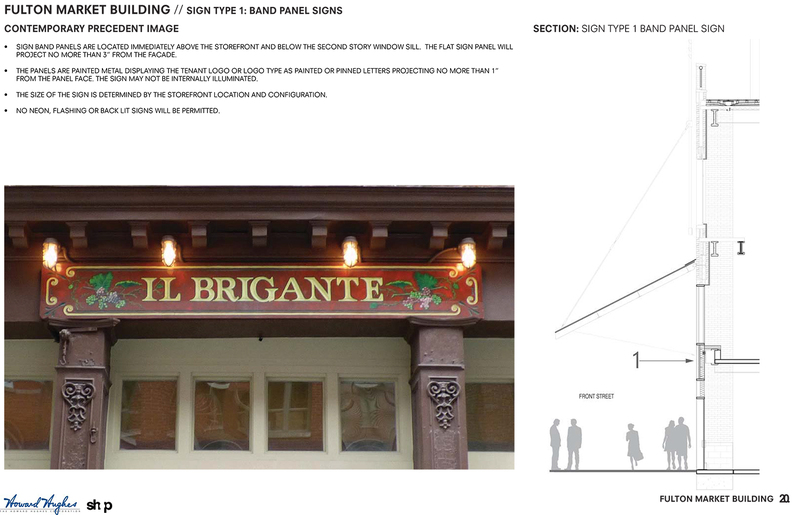 In this case, the plan is for eight signs. 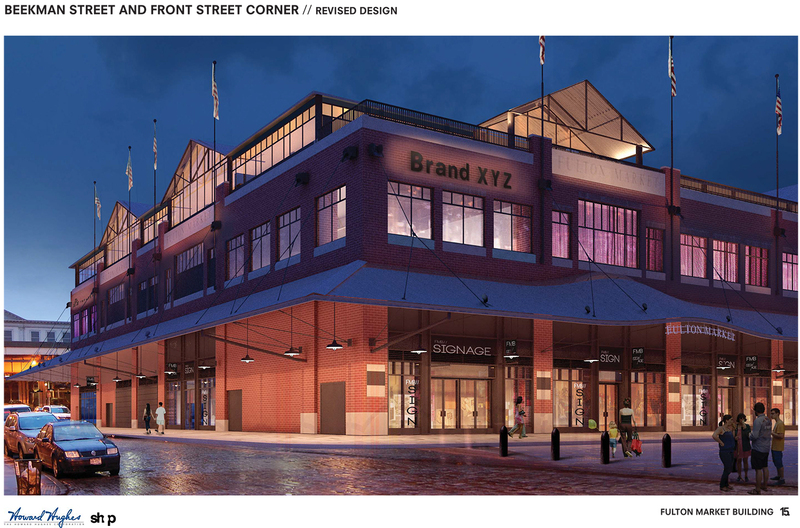 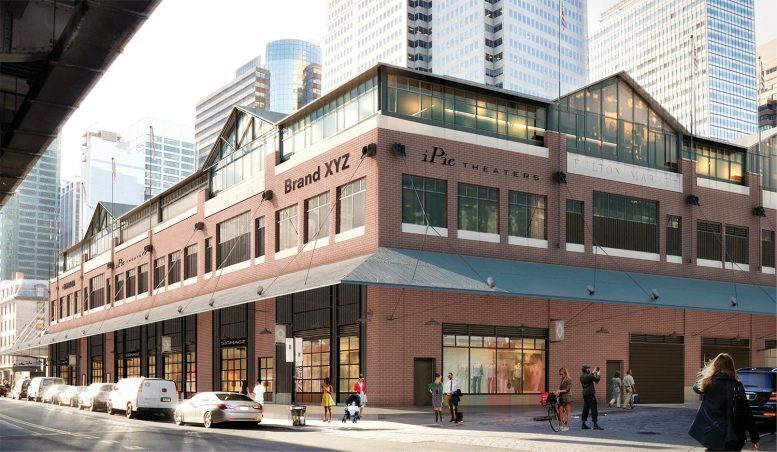 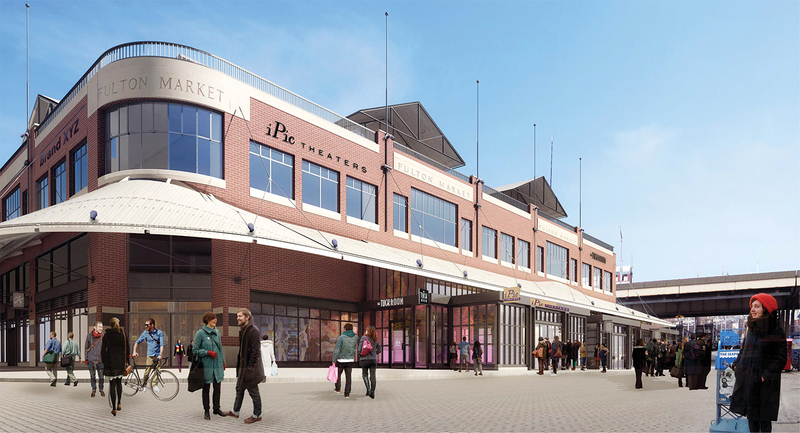 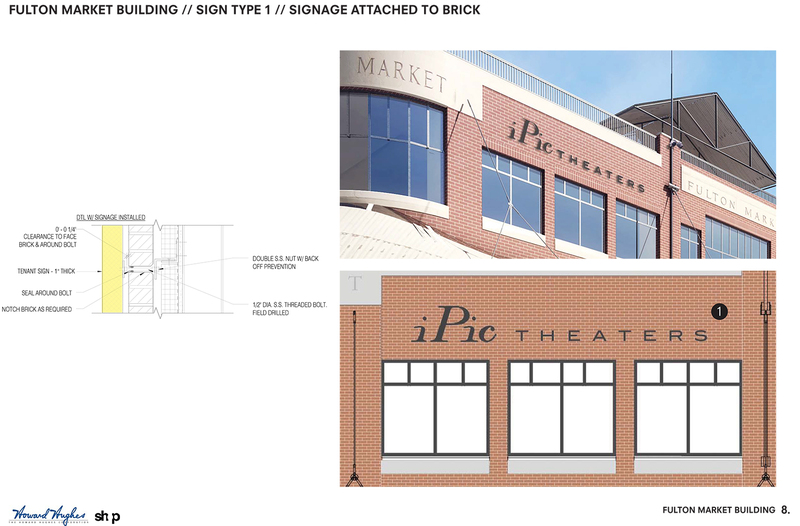 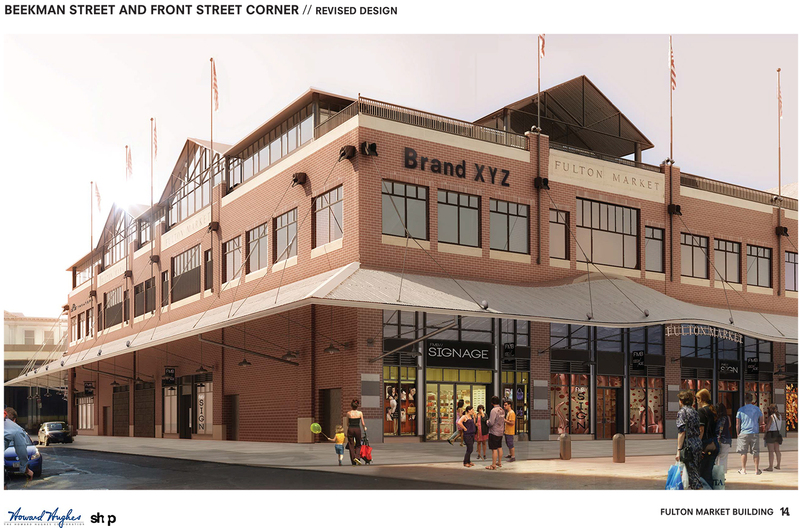 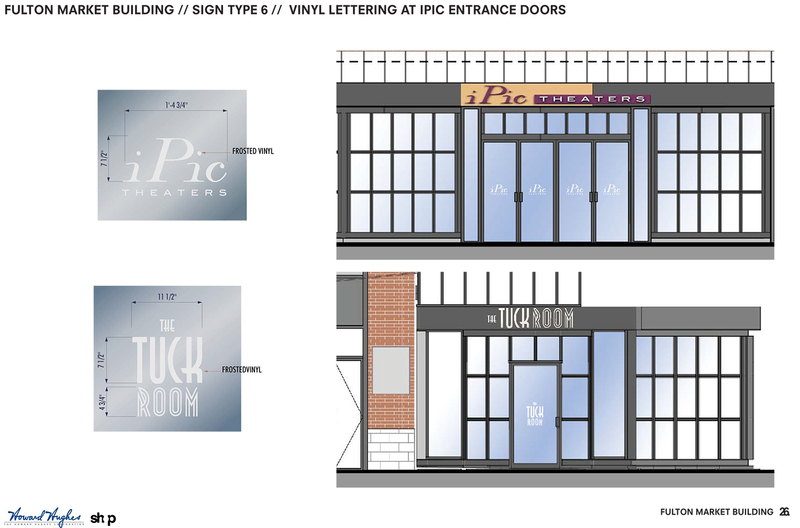 Three of them will be the for coming iPic Theaters multiplex, two for the bar The Tuck Room, and three for a yet-to-be named tenant, labeled “Brand XYZ” on the plans and renderings. 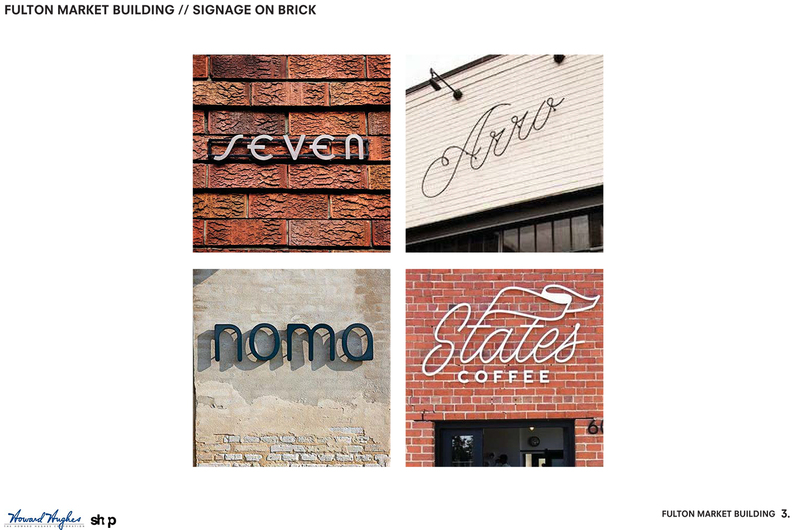 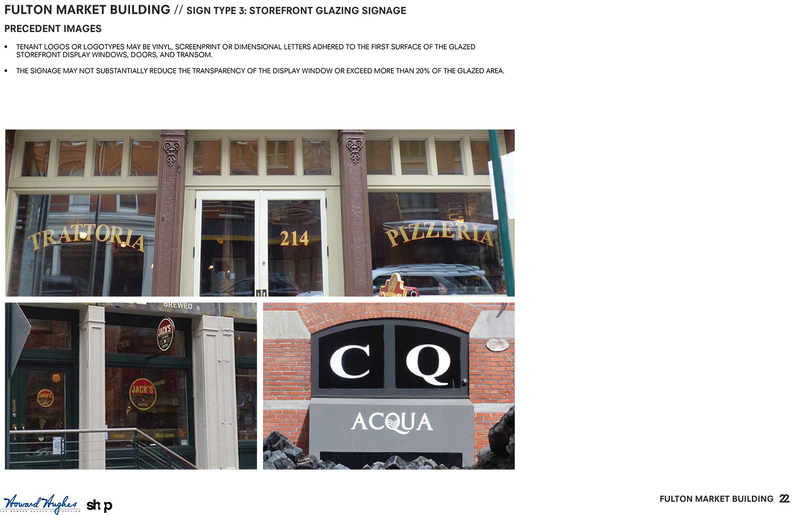 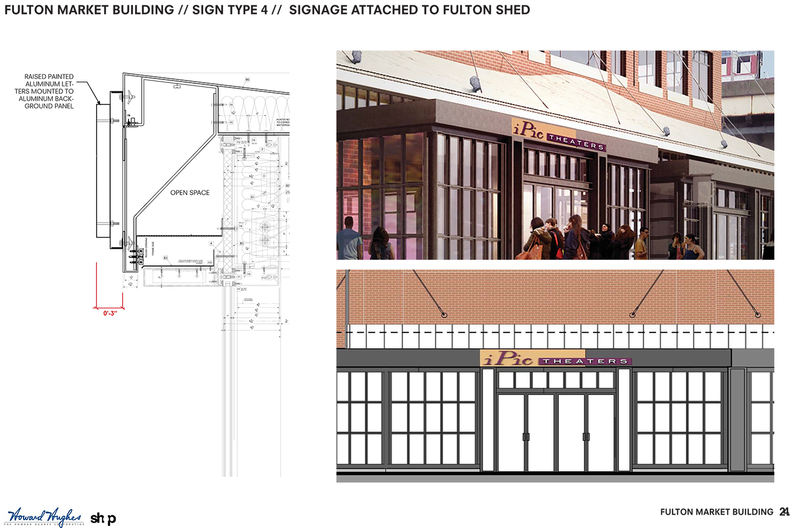 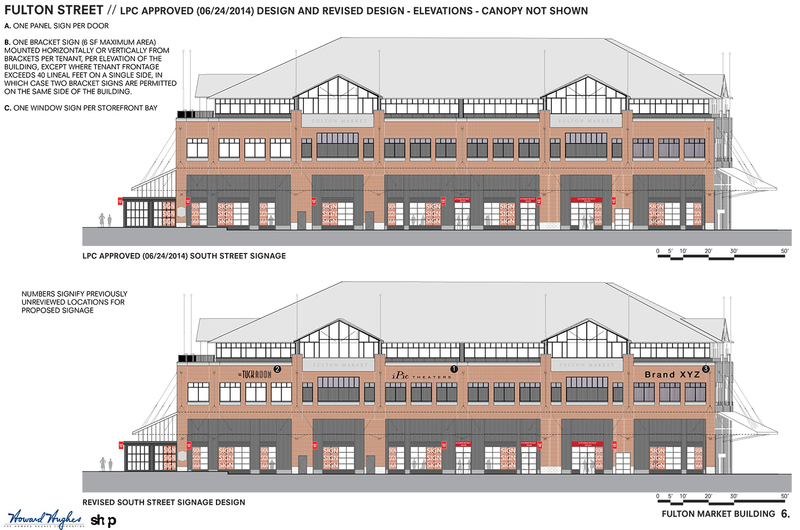 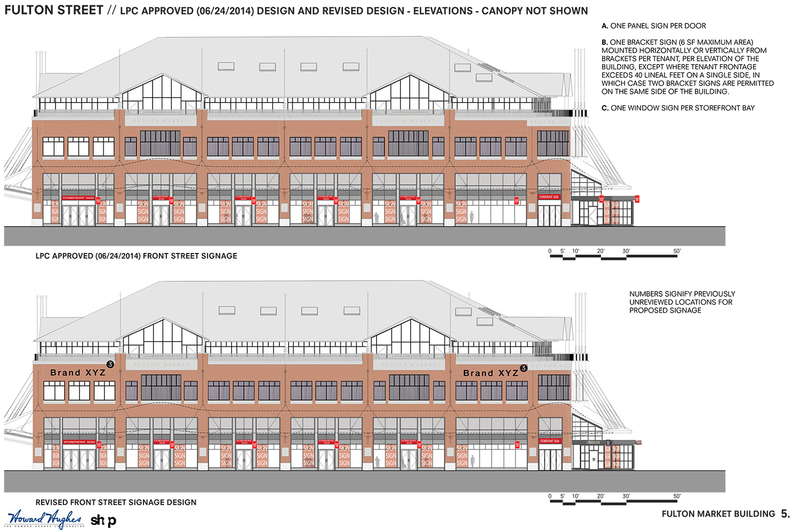 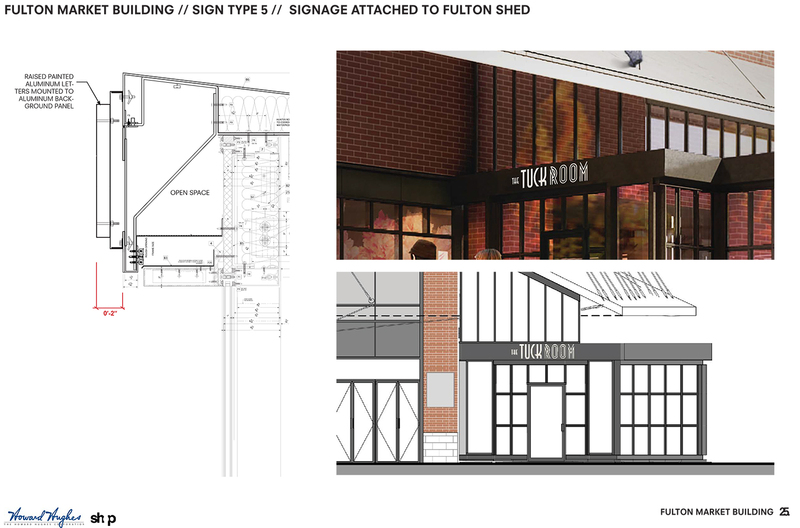 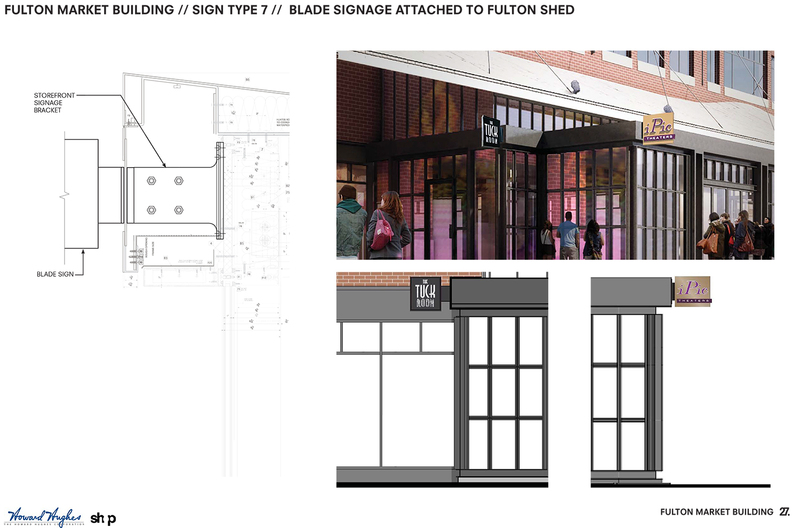 Commissioner Michael Goldblum said they didn’t enhance the building, while LPC Chair Meenakshi Srinivasan said she was “not particularly proturbed.” Some commissioners expressed concern over the size of the proposed signs, when compared the existing “FULTON MARKET” signage. 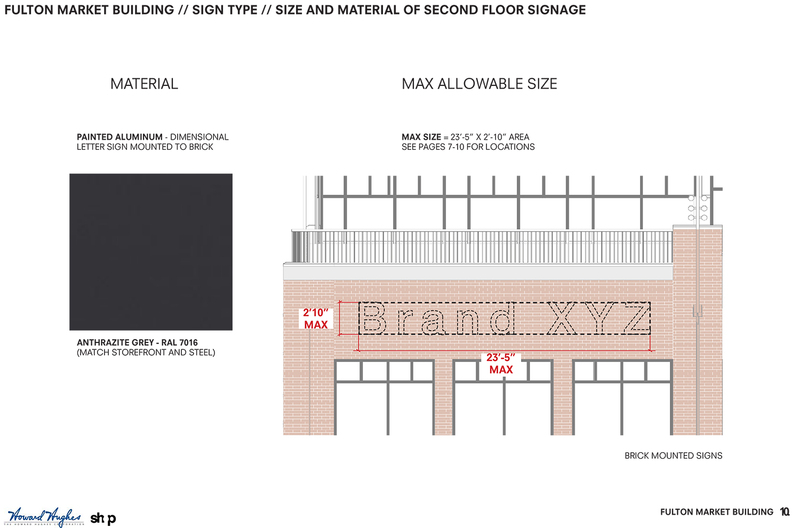 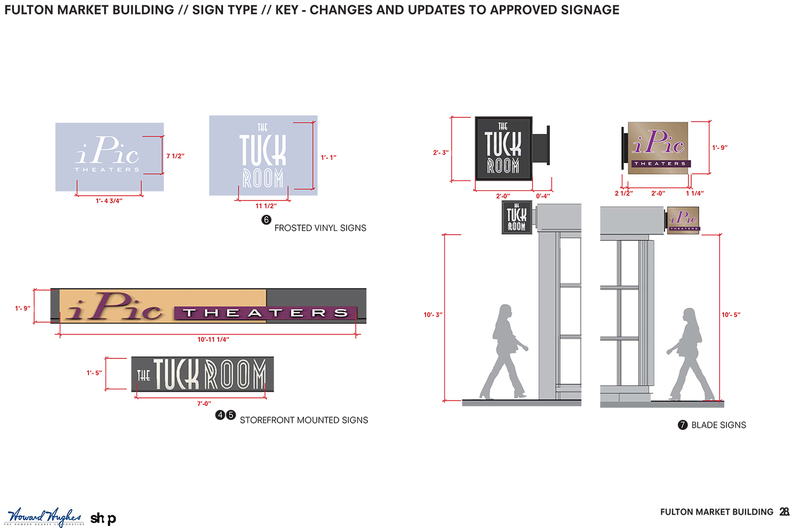 In the end, the commissioners voted to approve the proposal, providing the signage is an appropriate size when compared to the existing signage, particularly with the yet-to-be named tenant. 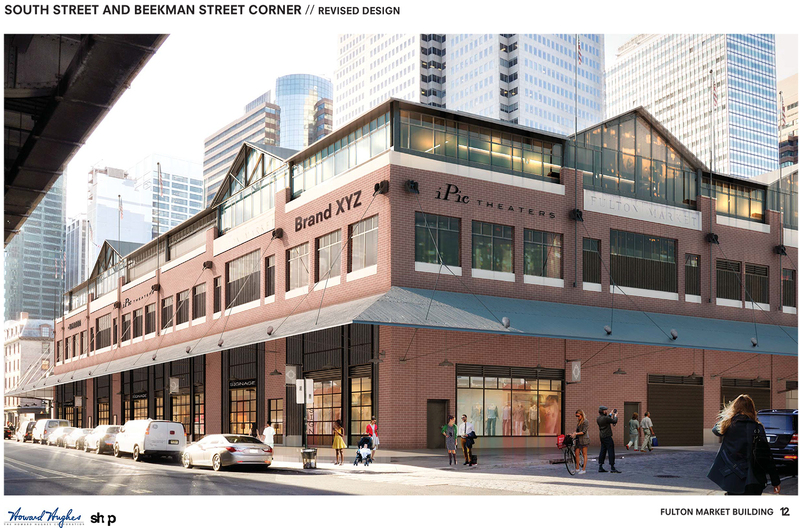 The design team will work with LPC staff to assure that. 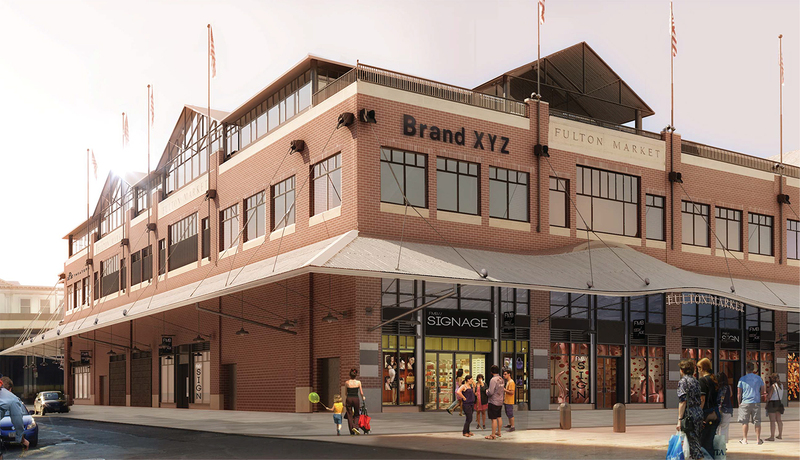 A spokesperson for the Howard Hughes Corporation said the company has yet to determine an opening date for the revamped Fulton Market Building.